Operations and maintenance (O&M) costs can make or break a business—especially with today's rising energy costs. DSOM (Decision Support for Operations and Maintenance) is an expert O&M system that integrates plant operations, fuel management, and maintenance processes. The DSOM package provides operators with the information they need for cost-effective operating decisions creating savings in fuel, personnel, maintenance, and power plant life extension. Linking power plant operators, maintenance staff, engineers, and administrators in one enterprise-wide system, DSOM combines online condition monitoring and control of equipment with unique diagnostic routines developed in Battelle's leading edge laboratories. Originally created for efficient operation of nuclear power plants, the science at the core of DSOM has been adapted to cost-effectively meet the needs of industrial processes, including power plants and continuous industrial processes. Diagnostic routines constantly watch the overall system performance and the performance of each key component to provide early warning of a degraded process. DSOM allows operators to make informed decisions about how to operate and maintain their plant most efficiently. A network of sensors constantly feeds information regarding the performance of the facility's components into a computer. 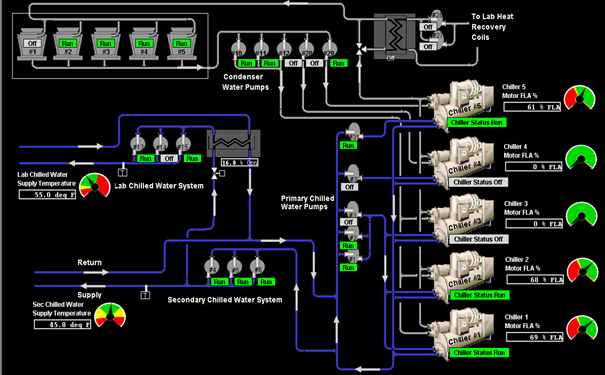 Using advanced communication techniques—adapted from industrial process controls—DSOM talks to most monitoring and control systems, mitigating the need for expensive upgrades of instrumentation for compatibiity. DSOM software collects and verifies operations data, analyzes them in a customized database, and lets operators know, in real-time, if a system is malfunctioning or running below expectations. Beyond looking for early warning signs of problems, DSOM identifies conditions that could potentially lead to a problem, identifies the root cause, and prioritizes recommended solutions. DSOM is built around the concept of condition-based management. This approach focuses on finding the balance between high-production rates, machine stress, and failure. DSOM's diagnostic capabilities prompt operators to make changes to keep systems operating at peak performance and avoid degradation and failures. DSOM displays information regarding a system's health and potential problems in different ways, matched to different needs within an organization. For example, one view is designed for operators while another is more useful to engineers. These intuitive, object-oriented displays, along with a point-and-click interface, make the system easy to use, requiring little training. A core philosophy of DSOM is that well-informed personnel make better decisions. Efficient power plant operations require a delicate balance of many interdependent aspects of facility operations. Process systems usually focus on immediate operation issues with occasional accommodations for maintenance and engineering. Rarely do they integrate training needs and the all-important administrative functions, including the impact on the plant budget. DSOM brings all of these together in one platform, linking plant operators, maintenance staff, engineers, and administrators in the same enterprise-wide system. With DSOM, users can quickly see the budget impact of their decisions. Engineering drawings, calibration charts, and manuals are just a click away. DSOM has potential applications in nearly any industrial process and can be applied in varioius industries. Examples might include power plant, central district heating and cooling, steel and aluminum production, pulp and paper plants, and pharmaceutical production. The DSOM technology was awarded US Patent #7,016,742 on March 21, 2006.